Get ready for the iPad clones. In a week that, according to Apple, saw iPad sales hit the two million unit mark, IDG News Service reports that the Computex Taipei trade show is anticipating demonstrations of a dozen or more rivals to the iPad. While the announced tablets differ in specifics, they share two major features: they don't run the Apple iPhone operating system, and they don't have access to the Apple AppStore. The question for manufacturers and consumers alike is whether a different set of hardware and software features can rival the iPad experience for users. 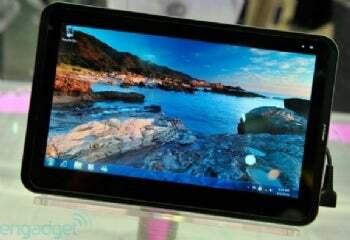 ASUS will be showing Eee Pad EP101TC and EP121 tablets which use different versions of Windows to hit different market segments. According to the IDG News Service, the EP121 aims at the laptop world, with a 12-inch screen, Intel Core Duo processor and Windows 7 Home Premium operating system. 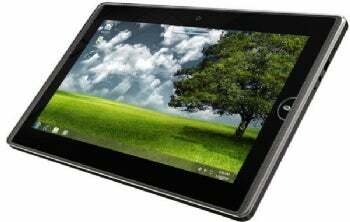 The EP101TC is more netbook-like, with a 10-inch screen, Windows Embedded Compact 7 OS and NVidia Tegra silicon on the inside. Engadget has a preview of the LG UX10 tablet, another Windows 7 Home Premium device with webcam, SD card slot, micro-HDMI output - essentially all the hardware pieces reviewers have said were missing from the iPad. Acer and MSI are expected to show tablets at Computex joining, according to Gearlog, companies like Dell and Sony that have already announced plans for tablet computers this year. All the tablets showing and announced follow a theme of using Windows software and filling perceived holes in the hardware specs of the iPad. While reviewers and power users have pointed out the iPad's lack of a camera, SD memory card slot, USB port and other features, two million sold units in under 60 days indicates that many don't see these shortcomings as fatal. The iPad does have an operating system with a user interface designed for touchscreen use, a user interface that Windows 7 can support but only as a secondary method of control and input. Apple's competitors are betting that a rich hardware feature set and (possible) lower price will attract users who see the potential in an ultra-portable tablet but aren't ready to join the Apple universe. The iPhone has shown that, while Apple can make a market that includes rivals, the Cupertino tech giant will keep most of the market for itself, leaving competitors to pick up the price-sensitive or Apple-averse for themselves. The tablets of Computex may move the market forward, but for now it's Apple's market that everyone else is trying to play in.